Planning consultants Halliday Fraser Munro have lodged a proposal of application notice with Aberdeenshire Council to develop land at Balmellie & Delgaty with up to 450 homes. 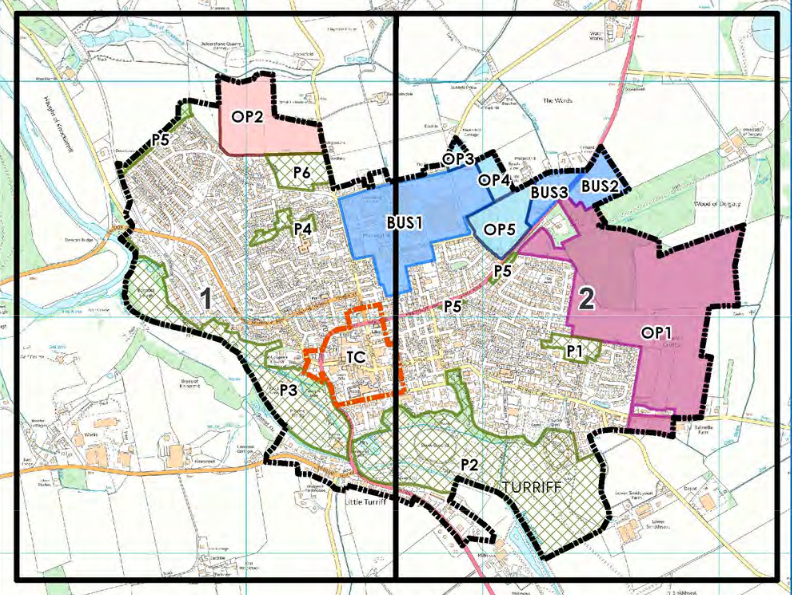 The application notice on behalf of Messrs Patterson, Cameron & Rennie is for the area known at M1 in the 2012 Aberdeenshire Local Development Plan. Site M1 is allocated for up to 450 houses, a new primary school and associated facilities and employment land (10 ha). Up to 130 houses will be delivered in the first phase, with the remaining 320 delivered in the second phase. A new distributor road will be located in this site with the potential to upgrade to a bypass. This site was previously allocated as site M1 in the 2012 LDP. A masterplan will be required for the development of this site. A minimum of two access points will be required for a development of this scale. Access via Banff Road (A947) and Balmellie Road may provide logical access points to the development through a new eastern bypass/distributer road, which will need to be designed to minimise any damage to the Woods of Delgaty and may require compensatory planting. Retention of the woods and their expansion through compensatory planting should be a significant part of the open space obligations on the site. Other access points to the development can also be achieved via Delgaty Crescent to the west. Connectivity for active travel to the rest of Turriff and the wider Aberdeenshire countryside is to be encouraged and provided for on the site. Safe active travel routes are to be provided alongside the new distributer road where possible to allow permeability within the site and a greater variety of travel options to the employment opportunities. These should be designed in line with national and local best practice guidelines to ensure safety and attractiveness of routes along a busy road and throughout the development site. Links to the existing adopted core path running through and adjacent to the site should be included as part of the design. Employment land should be mixed throughout the site, and easily accessible by a variety of travel options. Housing should be designed in a sympathetic manner to surrounding properties. Turriff is located in a unique location in Aberdeenshire where red sandstone and grey slate is used extensively in the architecture. It is expected that an appropriate colour palette will be used on the site to reflect local architectural customs. It is expected that no less than 112 affordable homes should be provided integrated within the site. Landscaping on the site will be encouraged to minimise the visual impact of the development on the rest of the settlement and surrounding countryside. Landscaping and open space should aim to link with existing open space to the south of the development site (at P1) and also with the Woods of Delgaty to enhance biodiversity and leisure opportunities on the site. Watercourses on the site may also be included in these. A flood risk assessment will be required for the site. A water impact assessment and a drainage impact assessment will also be required. the plan appears to conform with the Local Plan in regards to concept. It will be interesting to see the detail which may be revealed in the exposition which will take place in the Town House in early September. I wonder if the 450 homes which could see more than one thousand people ,( including many children) added to the population have been factored into the infrastructure ie schools, medical facilities and provision for social care? If the increase has been so factored I should be interested in how this was done. The Town House presentation should be interesting and I would encourage the people of Turriff to go to it. 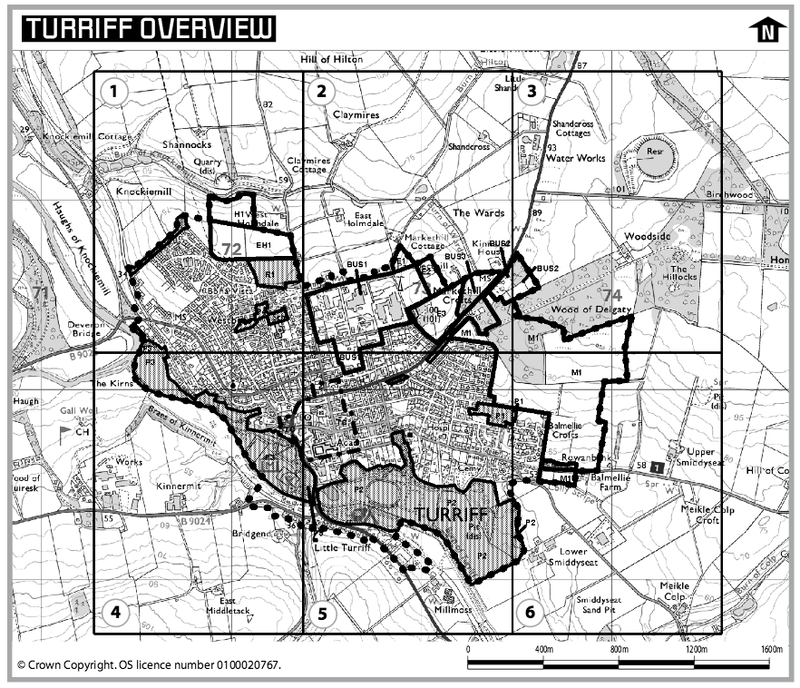 Halliday Fraser Munro have planned a drop in consultation event at Turriff Town House on 3 September between 2pm & 8pm. Members of the public can call in to see proposals for the development and speak to representatives from Halliday Fraser Munro.